It’s always exciting when playoff rounds go to Game Seven. That is what happened when the second-seed Anaheim Ducks hosted the seventh-seed Detroit Red Wings last night. The Ducks, who was a mighty intimidating team during much of the regular season, fell a goal short in the deciding game and were eliminated. Detroit will be heading to Chicago for the Western Conference Semifinals. It goes to show that once playoffs begin, what happened in the preceding months doesn’t much matter. In the postseason, every win matters, and every loss is another step toward the golf course. The Wings’ success means that the Kings will meet with the Sharks in the second round of the playoffs. The Sharks are one seed above the Red Wings, and one below the Kings, which gives the Los Angeles team their first playoff home-ice advantage since 1992. Many Kings fans looked forward to a Southern California rivalry. Potentially, fans would have been able to attend each game played, as the two hockey clubs only play 45 minutes apart from each other. Kings’ Dustin Penner would have had to play against a team with whom he won a Cup – while playing for a team with whom he won his second Cup. Instead, Los Angeles will host the first two games against a different much-hated rival. This promises to be a very physical and penalty-filled series. The Kings would do well not to take up any of the bait offered to them by their Northern California opponents (Raffi Torres, I’m looking at you). It may end up looking much like the Penguins vs. Flyers series last year if there isn’t enough emotional discipline on the ice. 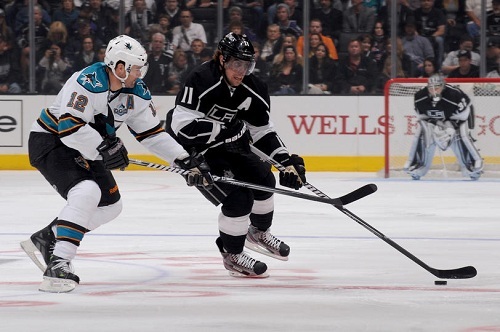 San Jose Sharks v Los Angeles Kings, LOS ANGELES, CA – APRIL 27: Anze Kopitar #11 of the Los Angeles Kings skates with the puck against Patrick Marleau #12 of the San Jose Sharks at Staples Center on April 27, 2013 in Los Angeles, California. They met in the first round of the playoffs in 2011, when the Sharks eliminated the Kings in six games. San Jose has had plenty of time to rest, after sweeping a humiliated Canucks team. The Kings are also getting some time to rest, and neither team will have to worry about time zone changes or long flights. The Kings vs. Blues series may have been exciting and physical, but things are about to get downright dirty. And everyone that makes fun of hockey in California is looking pretty silly right about now.